I've been involved with music since I can remember. I played violin and alto sax from fourth grade through high school. My father got me into playing guitar as a teenager and haven't looked back since. I've been playing for about twenty years now and have been writing original music for almost as long. My greatest joy comes from being involved in the creative process from start to finish, not just writing, but also producing. I graduated with a Bachelors Degree in Audio Production in 2013 from The Art Institute of Washington, in Washington, DC. 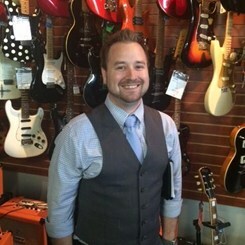 I have been with Music & Arts for over four years now, where I've worked in our Middletown, Exton, and Wilmington stores. I am excited to bring my expertise and passion to the Middletown location and the surrounding community. I look forward to seeing you in store!